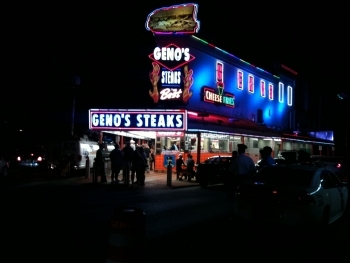 Joey Vento, the colorful and sometimes controversial owner of the famous cheesesteak shop Geno's Steak at the equally famous corner of 9th and Passyunk in South Philly, has passed away tonight of a massive heart attack. He was 71. Arlene Ackerman is out, but the story is far from over. $405,000 of her $905,000 payoff came from anonymous private donations. The private donations are legal and they helped the city taxpayers who only footed $500,000 of the settlement. However transparency watchdogs want to know who made the donations. Zack Stalberg, President of the government watchdog group, The Committee of Seventy, has called on officials to release the donors' names. New Music Director Yannick Nezet-Seguin, who begins with the Philadelphia Orchestra this season, has decided to increase his involvement and conduct more performances than previously scheduled. The most recent phase of the monumental restoration project - the cleaning and sprucing up of City Hall's interior courtyard - has been going on for a couple of years. The whole project, has cost about $83 million in capital funding for the facades. Cleaning the tower sculptures ran about $2 million in public and private funding. Arlene Ackerman is out as Philly superintendent. Her departure has been confirmed by the Philadelphia School District. Acting Superintendent Leroy D. Nunery II said his immediate focus is very short term - on hiring teachers, preparing buildings and organizing buses to open schools successfully on Sept. 6. On Thursday, Arlene Ackerman publicly challenged her bosses to release her at the annual principals' convocation.